The ability to anticipate, track and control behavior of a group of accounts established during the same time period (i.e. "vintage") underpins marketing activity and risk management policy at financial institutions. 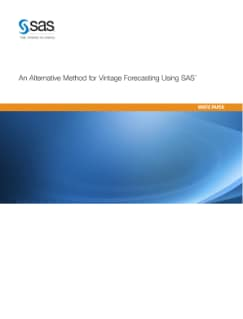 This paper presents a technique that treats the components of the vintage as a set of predictions and forecasts from a cross-vintage data stream. This methodology includes a variety of analytical techniques, including time series analysis, dynamic segmentation and clustering, vintage "profiling" and forecast reconciliation. An integrated approach to vintage curve modeling unifies internal bank drivers, external economic factors and past performance into one cohesive strategy – free from internal biases and more closely aligned with market reality. This methodology can serve to provide critical insight that supplements an institution's sales and operations planning process.